Run along New Jersey’s infamous Shades of Death Road, this race is associated with all manner of scary stories. History and legend tell of murders here as well as Native American tribe members whose souls are rumored to inhabit the dark, shaded forests nearby. Set among the Appalachian foothills of eastern Tennessee, this Halloween-themed race runs through the small city of Cookeville, starting on the campus of Tennessee Tech University. Now something of a running tradition in Portland, this Halloween-themed race sees participants dress out for the event in full costume for a run through this city’s urban parks and along the Willamette River. Filled with views of white-sand beaches and the ocean just off the course, this race starts and finishes in Fort de Soto Park, following a boomerang-shaped route along the seashore. Run along a mostly flat course that takes runners from the Los Angeles Memorial Coliseum and the campus of the University of Southern California to downtown L.A. and back, this race sees runners come dressed out in every costume you can imagine. Featuring a “wicked fast” course with little elevation change, this double-loop race is all about fun with costume contests and music and spooky decorations along the course. Designed to take runners past several of this city’s haunted sites, this race unfolds along a combination of city streets, residential neighborhoods and paved and natural trails along the creek just north of downtown that feeds into Lake Mendota. Run as a benefit for the locally based Capital Area Humane Society, this race in the small town of Potterville, just outside Lansing, features a Halloween costume contest and a race for kids. This German-themed race through Philadelphia’s Pennypack Park features what organizers call “German carbohydrates” (they mean pretzels) served at each of the aid stations along the race route, which of course are maintained by ladies dressed up as St. Pauli Beer girls. Run through this small Texas city that calls itself the “Cowboy Capital of the World,” this race unfolds through the farmland areas to the southwest of the city, with rolling hills and long, mostly gradual ascents and declines throughout the race. 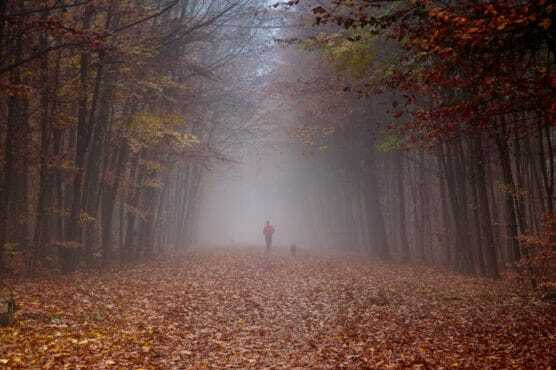 A Halloween-themed trail race that takes runners through the foothills of the Catskill Mountains, this race features plenty of challenging hills, deep woods forest lands to run through, wet and inclement weather conditions at times, and plenty of natural beauty surrounding you as you run. Set for its 3rd annual running here in this suburb of Austin, this race is mostly flat with some downhill sections through a series of residential neighborhoods, at which runners are welcome to wear their craziest costumes — or not. A race through the rolling hills of western New York, cool fall temperatures and the chance to run in your favorite Halloween costume, any character you want, awaits runners at this race here in “EVL” — short for Ellicottville. Just finished the Shades of Death Devil’s Run (6.66 miles, as opposed to the half which would be a second loop of the Devil’s Run) and it was GREAT! About 450 runners, on a cool, dry morning! Minimal hills, more downhills than uphills, that I remember! Great water and food supply afterwards too! I did a PR on 6.66 and many of the half marathoners PR too!